The messy bun is a look that’s always in style. It’s the perfect fix for a bad hair day, rainy day, hot day or even when your mane is starting to creep on over to the greasy side. The look is meant to be imperfect, but there are a few tricks to getting it right. The key to the perfect messy bun is to start with slightly dirty hair. It’s a great style for that third day before you shampoo again. While dirty hair is good, greasy hair will prevent you from getting the look you want. If you’re looking for texture and avoiding grease, use some dry shampoo before you begin styling. Adding volume to your hair will step up your messy bun game. The key to adding volume is to tease your hair. Start by pulling your hair into a ponytail and dividing it into a few sections. One section at a time, tease the hair until you have maximum volume. Wrap the sections in opposite directions to create your bun. Those with thick hair or curls will probably have an easier time creating a bun that looks effortlessly cool. Those who are lacking volume might need some help. Grab a foam donut, made for just this purpose. Put your hair into a ponytail and pull it through the foam donut, with the donut at the bottom of the ponytail. Wrap your hair around the donut and rolling it up until you reach the base of the ponytail. Secure with bobby pins. ponytail, then hold it straight up in the air and twist. Then, wrap the hair around itself, securing with bobby pins as you go. When you’re done, pull strands out and pin others down until you get the look you want. 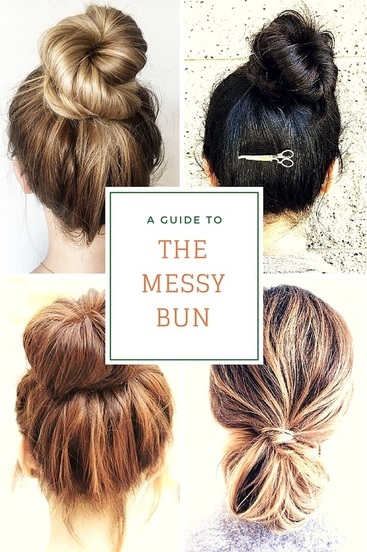 A messy bun should be just that — messy. Don’t worry about keeping strands in place or securing the pieces that don’t want to stay put. After you’ve made your bun, pull the hair until you have the volume and look you’re going for. Pulling a few strands out around the face can add to the effortless style.